Worthy is an interesting company with a hybrid business model. Before they came around, there were two options for selling your diamond. You can go the direct-to-consumer route via sites like Ebay or you can go the local route (retailer, pawn shop etc) that will purchase the diamond. There are fundamental flaws with both of these business models. We explain why Ebay is a terrible business model for diamonds in our review. Going the traditional route of finding a diamond dealer and selling it to them is fine. The problem is finding the right diamond dealer. For people who find our site, we’ve done that research and testing for you. As you can see from the test we did (you can read about it here), there was a wide array of responses. If you are searching on your own and find one of the dealers that low-balls every offer, you are flat out of luck. Worthy’s unique approach is to take your diamond ring and auction it to many diamond dealers, wholesalers and retailers. This way you get the highest bid from all of them instead of having to go to each of them, one at a time. While this sounds nice in theory, there is one “minor” problem with this model that seems to get left out of the discussion. Worthy needs to make money on your diamond as well. As we explain in our “Selling Your Diamond” article, you are already behind the eight ball when trying to unload your ring. There is no way you will get back as much money as you think. By going through Worthy you may be increasing your exposure when trying to sell your ring, but any gains in the offer are offset by the fee Worthy charges for being the middle-man. For the majority of people, the fee that worthy charges is 20%. Keep in mind that the people bidding from Worthy are industry insiders and experienced at purchasing diamonds. It’s not like there is going to be one person looking at their screen saying “screw it, I’ll pay 50% more than anyone else is bidding” and make your day. How does Worthy work? You head over to Worthy’s site, put in basic information (type of ring, diamond etc) and they give you an estimated range of bids you would receive. If you decide to proceed, they send you a shipping label and you send them your jewelry. This is the biggest bonus working with Worthy. Every ring they auction off will have a GIA or IGI certificate. If your ring doesn’t have one currently, they will send it to the lab at no cost to you (I don’t know how they operate, I’d imagine that they will reject some items as its not worth the money to certify it). This is very useful as local appraisals don’t really tell you what the quality is. So we were looking to sell a Tiffany ring that we had purchased for our updated review. It was a 0.53ct I color, VVS2 clarity round diamond in the classic Tiffany platinum solitaire setting. We purchased the ring for $4,500 (yes, we know that’s overpriced). After filling out their form, I started a conversation with someone at Worthy. At that point, I already had the offer (pending inspection) from Abe Mor for $1,850. The estimate that popped was only $1,100ish. I mentioned that I had a significantly higher bid and didn’t want to waste their time (and mine) if they didn’t have a chance of beating that bid. Due to their commission, they would need to get a bid over $2,100 to beat my current offer. The sales rep for Worthy said they would reach out to some of the bidders (companies that usually purchase Tiffany rings and are willing to pay a premium). A couple of days later he got back to me saying he thought there was a good chance to make that number. I sent them the ring. A few days later, the ring was ready for auction. Unfortunately the bids were far more inline with their initial estimate. The final bid was $1,458. After their 20% fee, the final amount I would receive was $1,165. I was kind of disappointed that the sales rep pushed hard for me to send it in (despite not getting any bids remotely close to what I told him I needed). Maybe he didn’t believe me when I said I had another offer, or maybe some of the people he spoke to didn’t bid near what they said they would. But it did feel like a waste of time to me. 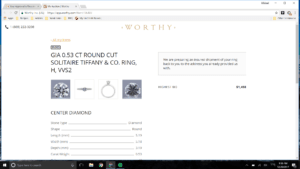 While Worthy’s business model is interesting, I don’t think it offers people the best value when trying to sell your diamond jewelry. Our secret test reinforced my opinion. We got a much better offer from Abe Mor for the same ring and the process was much simpler.